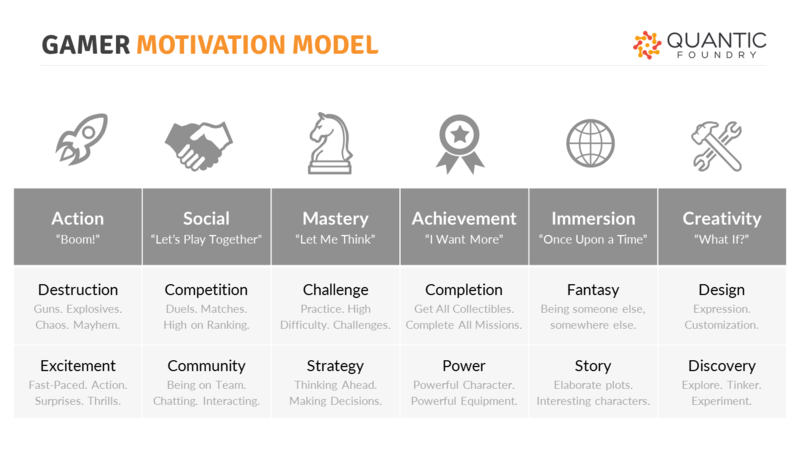 Related to the marketing question, here is a model for categorizing player motivation. Which do you think best fit Transcendence players? For me, it was "Action - Boom!" The only other game like this that I was familiar with back then was Star Control 2, although Transcendence plays more like Diablo in space. Today, the main reason I continue to play Transcendence is to maintain the mods I made for it. Otherwise, I probably would have left, or maybe visit once every few years. To answer the question, Transcendence plays a bit like Diablo. Diablo has the action of Gauntlet (Legends) and the randomness of some Roguelikes (like Nethack or DRL). Transcendence would probably attract those who like dungeon-crawling action. Well, Transcendence is an action game, but it's a reasonably difficult one where you need knowledge, resource management, preparation, and tactics to succeed. So it's also high on the mastery and achievement scales. Missions and background flavor text contribute to immersion, but it's not particularly high there. Modding can use some creativity, but playing the game not so much. Yes, it is true the player needs a plan to win (without dying). Transcendence is not the kind of game to hand the win on a platter if player wants to honor permadeath. It would be nice if there was a mode that enforced permadeath. It's Action with a little Achievement thrown in. I really don't think Mastery is even a point here. That's whole nother level of thought. Action and, to a lesser extent, Achievement are going to be the main draw for most players. …Unless they get into modding, at which point Creativity gets a big uptick.